Like many writers, I first put words to paper writing poetry. It is the simplest form of expression for me given that there is constant inspiration provided by the world around us to scribble something down on a napkin or to use the more methodical process of recording my thoughts in diary. Although these days I am more focused on writing novels and screenplays, I still find myself drawn to the endless satisfaction structuring words into prose. 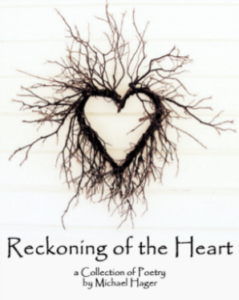 I have just finished an anthology of previously published work and some newly written poems appropriately named A Reckoning of the Heart. The title of collection is based on a poem for which I won my first monetary award. I remember clearly thinking at the time “that I had arrived”, but of course in retrospect, it was nothing other than an affirmation to continue working on improving my craft. cat-eyed moon dangling from the edge. to dislodge the weight of my smothered spirit. stabbing resting periwinkles along the foam line. succumbing to this reckoning of the heart. the lighthouse beacon scraping a bandeau of silver. warming the cool blood of neglect. tarred, barnacled legs holding ground. awash in the sanctity of each other. its high fins cutting through the lush night air. tasting the freshness of a new beginning.